Welcome to St. Martin-in-the-Fields! 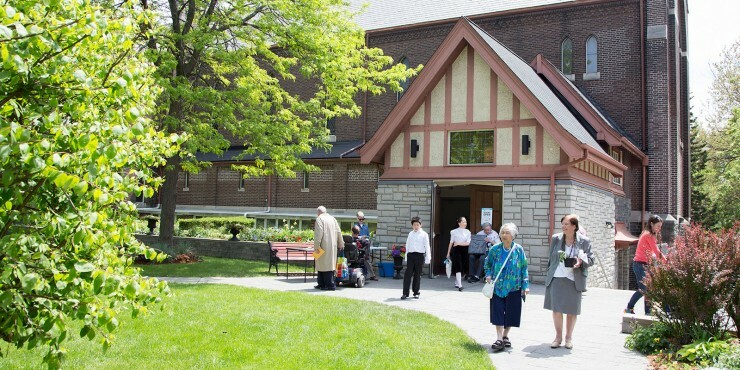 We are a busy Anglican church in the High Park neighbourhood of Toronto, just south of the Junction. Our community is open to everyone, wherever you are on your spiritual journey. We hope you will find these notes helpful. You can also ask our sidespeople or clergy if you have any questions about our services or life at St. Martin’s, or feel free to email us! We are located at 151 Glenlake Ave. in Toronto, just east of Keele and one block north of Bloor. Some parking is available on the streets surrounding the church. We’re also a short walk north from Keele subway station. Wear whatever you feel comfortable in. “Smart casual” or “business casual” is a good place to start, but you’ll find people dressed in many different styles at St. Martin’s, from jeans and t-shirts to shirts and ties. A greeter (also called a sidesperson) will welcome you and give you a bulletin with the details of the service. Feel free to ask any questions you might have. You can sit wherever you feel comfortable. In the pew, you will find the green Book of Alternative Services, which includes the words of the service and prayers. There are page numbers in the bulletin to help you follow along. You will also see a blue hymn book in your pew, which you can use to join in the singing. The hymn numbers are printed in the bulletin and listed at the front of the church. Do my children stay with me? It’s up to you! You’re very welcome to keep your children with you for the whole service. At the 11 am Sunday service, children can join our nursery or Church School downstairs before the service starts – just ask the greeter for directions. Children rejoin their parents for communion and the end of the service. You might be wondering when you should do what: kneel, sit, stand, say “Amen.” As a general rule, we sit to listen, stand to sing or proclaim, and kneel to pray. Just relax and follow what others are doing. You may see people bowing or crossing themselves at certain times, but this is a personal choice. Do what feels comfortable for you. We sing at many points in the 11 am Sunday service, led by our beautiful choir. Don’t worry if you don’t know the tune or you don’t feel comfortable joining in – you won’t be the only one not singing. If you feel lost, don’t hesitate to ask someone for help. We were all new once! Does St. Martin’s use incense? Yes, St. Martin’s uses incense at the 11 am Sunday service. It is an ancient and prayerful tradition that helps to incorporate all of our senses and our whole selves into worship. Incense enriches the liturgy for many, but we know that not everyone is comfortable with it. If you think the smoke might bother you, you can sit towards the back of the church. Do I have to put money in the collection plate? We take a collection during the service to support our ongoing mission and ministry. Making a financial contribution is completely voluntary. If you would like to contribute, you can use one of the envelopes for visitors you’ll find in your pew, or you can put your contribution straight into the plate. Can I receive Holy Communion? What do I do? All baptized Christians are invited to receive the bread and wine at communion. Everyone, baptized or not, can come forward for a blessing – just cross your arms over your chest when the priest approaches you. You can also choose to stay in your pew during this part of the service. It’s up to you. When it’s time for communion, the sidespeople will stand in the centre aisle and direct people to go forward to the altar, row by row. Follow those ahead of you to the front of the church, where you may kneel or stand at the altar rail. The priest will speak a short prayer and place a communion wafer in your palm for you to eat. We drink real wine from a common cup or chalice, which will be offered to you after you’ve received the bread. It’s okay to touch or steady the cup as you take a sip. You can also choose to receive only the wafer. Cross your arms over your chest when the cup approaches you, or just leave the communion rail once you’ve received the wafer. If you need a gluten-free wafer, have any mobility concerns or would like communion brought to your pew, please speak to one of our greeters. After the 11 am Sunday service, we gather for fellowship and refreshments in the parish hall (in the basement of the church) or in the garden, weather permitting. Please feel free to join the conversation! We’d love to get to know you.